500 Downloads on the NSF-1701 Phase I Test Report from this thread and last. Moral of the story...people are still interested in the emdrive concept and they are starving for information. Does not look like Cannae, Tajmar, Shawyer or Yang have anything new to report. Still have hopes that EW is busy at it from the rumors I heard last year. If anybody else finds anything out there, be sure to post it here. Haven't heard much from this side other than rumors that something might be happening. Who knows what it will be. Back at it... still working at it. Everybody is so tight lipped, that it's somewhat disquieting, like the calm before the storm. Hopefully these happenings include EagleWorks proving their point to the NASA's internal review boards, and getting more appropriate funding, which could result in a news-worthy paper by end of the year. Or maybe Dr. Tajmar and his diligent Ph.D. students have continued doing experiments, with much better results by now. Well, that's maybe just me and my child-like desires to see this work, but this calm is indeed odd. It is funny, isn't it? Have to think that a "breakthrough" in determining this whole thing were measurement or system error would have hit the boards long ago, but they have not. And this is from labs that have a reputation for doing so. Consider the quiet experimental labs that are likely hoping to disprove this thing and become the first to lay it to rest. Silence. And I don't think its becaused no one tried. Probably a good time to review the report Roger Shawyer put together way back in 2002 on his 1st Experimental EMDrive where the measured Force was 16mN @ 850W. Lots of good info there for our current magnetron based DIYers. Even back then he used a circulator and a load for the reflected power so as to stop it heating up his magnetron. Because of the use of a waveguide assy, he had a way to impedance match the frustum to the magnetron using both a screw and a choke, which I assume is an aperture. Also included Roger's latest summary of reported experimental data, with Specific Force (N/kW) sorted by measured loaded Q. My goal here is simple. Get Our Butts To Mars. So, I just had a ton of fun trolling on reddit. But in all seriousness I respect what all DIY builders are doing. I would never troll this thread. Ever. I completely hate reddit. Several active users of NSF, including RFMWguy and SeaShells, are active and positive contributors to the EM Drive Subreddit, which is a real and significant part of the community of interested researchers and bystanders. You do us all a disservice by trolling the other, interested parties out of spite for their host. Reddit is simply raw humanity. They are good people there who really want to know and understand what's happening. I'll post for them. 100mN is better than the best ion thruster (92mN). I build space systems with [email protected] switches - there are [email protected] solid state switches out there off the shelf. If we can really talk about 12N of thrust per switched service(12.5Kw) with non-superconducting frustrums Mars gets easy and Titan becomes possible. With a super conducting system? Heck, Alpha Centauri may become possible. Additionally every satellite built today that has more than a very short life uses both reaction wheels that wear out and thrusters that use propellant that gets used up. To replace both requires probably at least 4 EM drives per satellite (yaw,pitch,roll,thrust) and probably a second set for redundancy. To say that this is a potential $Billion business is not exaggerating. NSF-1701 Phase II Testing Update - Donations have allowed me to upgrade the PC and get a Spec An module for it. Also ordered another identical magnetron to start modifications for cleaner signals...thus the spec an. Also have to design a feedback system to denote resonance. Thought about this alot. Going back to my old tube days, dip the plate current for resonance...not sure if this will work for mags however, they are strange animals. You do know of the EMDrive powered IXS Clarke? Scroll down for transit times versus 0.4N/kW or 4N/kW. My research suggests 4N/kW and more is doable without going to superconductivity. Transit times are from Eagleworks. It is a tube abet a interesting tube but follows most characteristics of a tube. I looked at the ability to shift frequencies in the magnetron and you are quite right it's not that easy. To begin it was easier to stabilize the frustum than mod the magnetron and latter if it was still needed to shift frequency and lock it with a feedback system it will not be quite as hard. 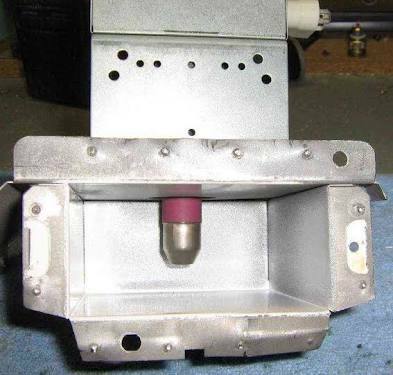 At one time I was looking at a transducer or voice coil on a end plate to vary the cavity dimensions, it may be something you might also want to look at. The thermal growth cycles are well within the range. Suggest feeding the maggie full wave rectified and filtered 4,000vdc will go a long way toward reducing the freq splatter. Also try to use the oven's existing waveguide and maggie to waveguide assy as it is designed to over good VSWR to the mounted maggie. It may have a inward dimple, which is for impedance matching. Could flatten it and put in a threaded bolt or 3 to do good impedance matching or go with the existing dimple. Will do my full wave filtered maggie schematic for you over the weekend. The daily rad makes doing any serious work very difficult. But Horray for 2 days away from the rad treatments. You're a little off in your estimate. Now to the main reason for this post. After reading through the last few pages of this latest version of the NSF.com/EM-Drive forum, some of you might find interesting the following microwave RF source data. I've run across several papers over the last few months on how to make the magnetron from a kitchen microwave oven into a frequency tunable, narrow-band, and stable RF source with very low phase noise, just right for the kind of work that Dave, Shell and The Traveler are performing, or will be performing on these EM-Drive thrusters. These cross-field magnetron design modifications are authored by an RF engineer by the name of Bill Brown who died in 1999, (See: https://en.wikipedia.org/wiki/William_C._Brown ), and their simplicity and elegance are still striking, at least to me. In the hope that these papers have not already been posted elsewhere in these EM-Drive threads, or as a reminder to all if they have, find them attached. BTW, Mr. Brown's phase-controlled, frequency-tunable magnetron design, using feedback from a sense antenna in the frustum, only has a frequency tuning range of ~15MHz as currently designed, so Dave D. will have to use a hybrid mechanical/electrical tuning system for his frustum to obtain his desired +/-40MHz tuning range. Or Dave could increase the magnetic-field output in the magnetron's B-field Buck-Boost coil used in Brown's design by increasing its driven current range, which might get the increased frequency range Dave needs. Best of luck to all your efforts and keep up the good work! Certainly more efficient than a thermoelectric cooling would be to integrate in the arms of the thrust balance a high efficiency heat pipe similar to those used in communication spacecrafts to transport the heat generated by high power Traveling Wave Tube Amplifiers (TWTAs) to radiative panels looking at the cold space. The heat generated by the magnetron located at one arm end would be transported to the other end for a somewhat similar/symmetric dissipation process. Good to see you again, you are missed. I've read your inputs from almost day one and they were a great help to all. I believe these designs were posted a couple of months ago when ElisbethGreen was still posting, but it is good to revisit them again. It is a beautiful design and one I considered way back then. Currently I have plans in slightly modifying a Inverter from Panasonic to deliver a cleaner power signal and variable power than the standard power supplies. I'll need to see how stable my thermally compensating frustum design is as to how much I might or might not need to phase lock the RF to the frustum. I suspect with the high Q frequency tunning is going to be needed. One other point, we all are here rooting for you and the EagleWorks team. Thanks Paul and welcome back! Kurt! Very cool, thanks for the links!